Lip Smacking Sandwiches – Adding chicken breasts to homemade sandwiches is unbelievably easy. All you have to do is cut tiny chunks of baked or roasted chicken breasts with seasoning of your choice and spoon in some cheese and mayonnaise for the easiest possible treat that you can fix in minutes. This can also make a complete meal depending upon how much chicken and veggies you put into your sandwich. Try BBQ chicken grilled cheese sandwich, grilled honey-lime chicken sandwich for an out of the world experience. Tongue Tingling Salads – Chicken breast salad can be any weight watchers delight. 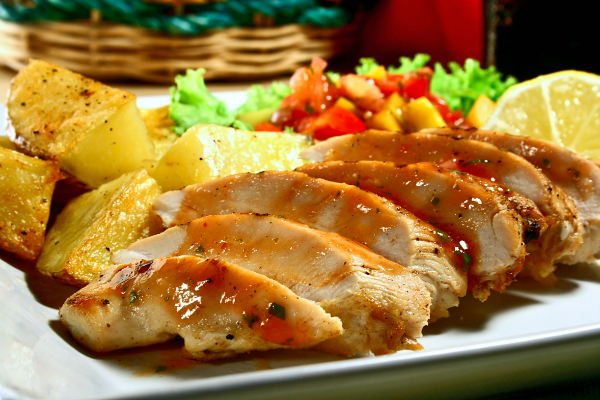 This is one of those exceptionally healthy options where the plain boring chicken breasts can be paired with just about any vegetable, fruits, seasoning, dressings, cheese and probiotics to make a complete and tasteful meal. Try recipes like lemon chicken with cucumber feta salad and avocado chicken salad for a blissful treat. Curry and Gravy – Most lip smacking oriental curry and gravy recipes are never complete without chicken breasts. If you are finding your usual grills and roasts and bit too boring, you can always try certain easy and non demanding curry / gravy recipes and pair it up with steamed rice with herbs to introduce a refreshing change to your taste buds. The Thai Green Curry chicken and the smooth Indian butter chicken are highly recommended for experiencing the better side of chicken breasts. Healthy Dumplings Steamed and Fried – Dumplings are often considered a blessing to the taste buds that have come from the oriental East. There is just about anything that can get into a dumpling and come out brimming with taste. Pack in some chopped chicken breast with oriental flavoring, spices and herbs as per the recipes of your choice and enjoy a healthy and tasty delight which can be just as good as a small meal as it could be a snack. If you are not too conscious about your calorie intake, then you can fry the chicken breast dumplings for an added boost of taste. Soups and Stews – Chicken Breast soups and stews are not for the sick and ailing only. With the right recipes, these can actually be bowls of pure heavenly delight. Try the chicken tortilla soup, Oriental chicken breast noodle soup, creamy chicken stew and Irish chicken stew for experiencing the better of simple recipes. At the same time, do not restrain yourself from introducing your personal touch to the tried and tested recipes.